Attack of the Killer Social Media Robots! The late, great science fiction writer Isaac Asimov frequently referred to the “Frankenstein Complex,” That was deep-seated and irrational phobia that robots (i.e, artificial intelligence) would rise up and destroy their creators. 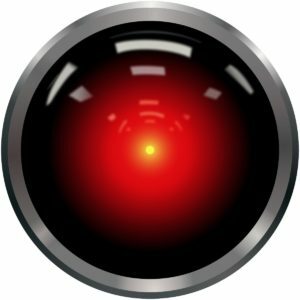 Whether it’s HAL in “2001: A Space Odyssey,” or the mainframe in “Colossus: The Forbin Project,” or Arnold Schwarzenegger in “Terminator,” or even the classic Star Trek episode “The Ultimate Computer,” sci-fi carries the message that AI will soon render us obsolescent… or obsolete… or extinct. Many people are worried this fantasy will become reality. Facebook may have just created something, which may cause the end of a whole Homo sapien species in the hand of artificial intelligence. You think I am being over dramatic? Not really. These little baby Terminators that we’re breeding could start talking about us behind our backs! They could use this language to plot against us, and the worst part is that we won’t even understand. Well, no. Not even close. The development of an optimized negotiating language was no surprise, and had little to do with the conclusion of Facebook’s experiment, explain the engineers at FAIR – Facebook Artificial Intelligence Research. Similar to how people have differing goals, run into conflicts, and then negotiate to come to an agreed-upon compromise, the researchers have shown that it’s possible for dialog agents with differing goals (implemented as end-to-end-trained neural networks) to engage in start-to-finish negotiations with other bots or people while arriving at common decisions or outcomes. To go beyond simply trying to imitate people, the FAIR researchers instead allowed the model to achieve the goals of the negotiation. To train the model to achieve its goals, the researchers had the model practice thousands of negotiations against itself, and used reinforcement learning to reward the model when it achieved a good outcome. To prevent the algorithm from developing its own language, it was simultaneously trained to produce humanlike language. The blog discussed how researchers were teaching an AI program how to negotiate by having two AI agents, one named Bob and the other Alice, negotiate with each other to divide a set of objects, which consisted a hats, books and balls. Each AI agent was assigned a value to each item, with the value not known to the other ‘bot. Then the chatbots were allowed to talk to each other to divide up the objects. The conversation continues with variations of the number of the times Bob said “i” and the number of times Alice said “to me” in the discussion. When Facebook directed two of these semi-intelligent bots to talk to each other, FastCo reported, the programmers realized they had made an error by not incentivizing the chatbots to communicate according to human-comprehensible rules of the English language. In their attempts to learn from each other, the bots thus began chatting back and forth in a derived shorthand—but while it might look creepy, that’s all it was. Facebook did indeed shut down the conversation, but not because they were panicked they had untethered a potential Skynet. FAIR researcher Mike Lewis told FastCo they had simply decided “our interest was having bots who could talk to people,” not efficiently to each other, and thus opted to require them to write to each other legibly. No panic, fingers on the missiles, no mushroom clouds. Whew, humanity dodged certain death yet again! Must click “like” so the killer robots like me. https://alanzeichick.com/wp-content/uploads/hal-1.jpg 1200 1200 Alan Zeichick http://alanzeichick.com/wp-content/uploads/alan-zeichick-logo.png Alan Zeichick2017-08-05 16:56:122018-05-17 13:52:05Attack of the Killer Social Media Robots!